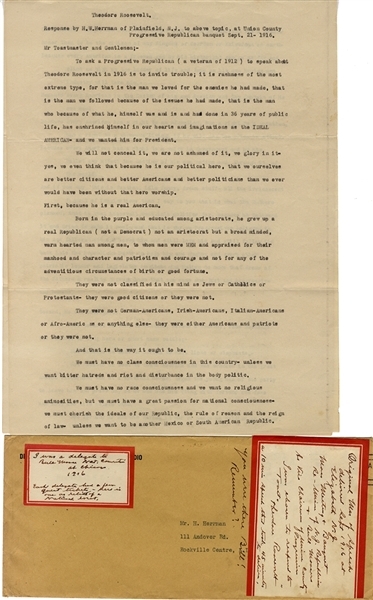 A six page, double-space speech given by H.W. Herrman, Plainfield NJ, September 21, 1916, at the Union County Progressive Republican Banquet. Here are some excerpts; “... men were men and and appraised for their manhood and character and patriotism ... They were not classified as Jews or Catholics or protestants - they were good citizens or they were not. ... They were not German-American, Irish-Americans or Afro-Americans - they were either Americans and patriots or they were not. ... We must have no race consciousness and we want no religious animosities, but we must have a great passion for national consciousness - we must cherish the ideals of our Republic, the rule of reason and the reign of law - unless we want to be another Mexico ... Every American is a freemna, can go as far and climb as high on the ladder of life as his own brains and industry will take him ... Nation first - that was the Square Deal of 1916, and that’s why we say, Teddy, you’re a bear.” Comes with the original envelope which has further provenance. VG.